As soon as my friend Stephanie taught me how to make these pretty little felt roses, I knew I would soon use them in a crafting project. 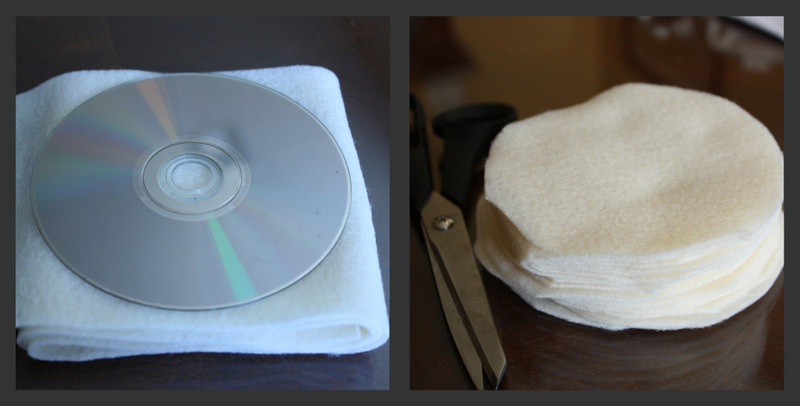 So darling, and so simple to make! 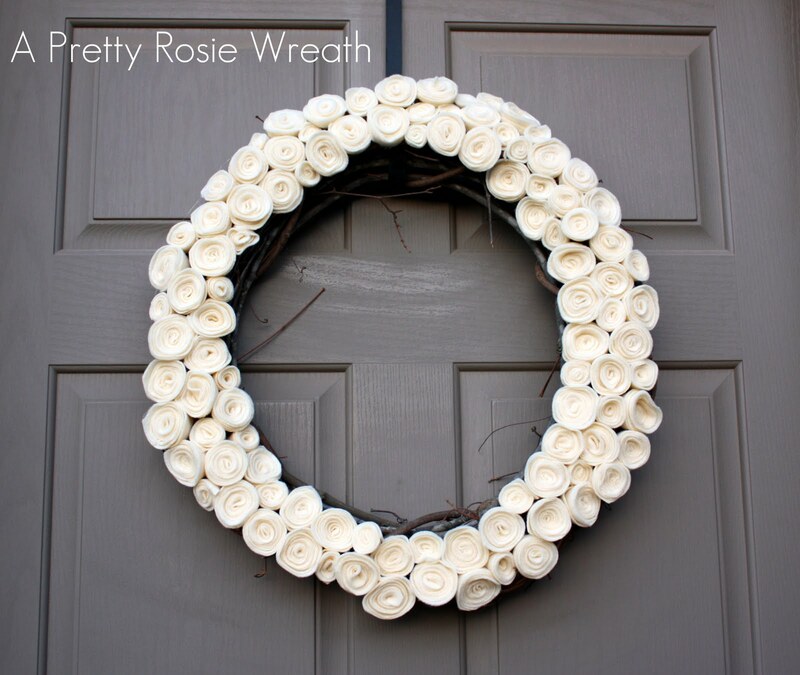 I soon realized that a wreath covered in these would be a beautiful and fun project. I made the wreath pictured above this afternoon and I am so happy with the result. I couldn't resist sharing! The whole project cost less than $8.00! Yeah! 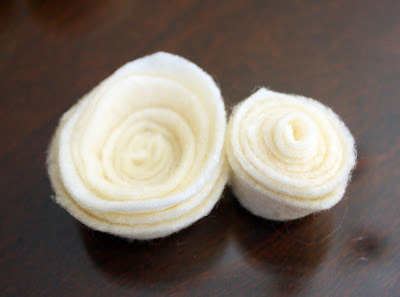 To make the pretty little roses, begin by cutting out a whole bunch of circles from the felt, using the c.d. as a pattern. To speed up the process, I cut long strips of felt the width of the c.d., then folded it up accordion style so that I could cut out about 7 or 8 circles at a time. Next, spiral cut each circle. I layered my circles three at a time when I did this. Start from the edge and spiral cut all the way around until you get to the middle. Then, take a spiral and roll it up. Starting with the middle, roll it so that the edge you cut is all lined up and even. Thus, the bottom will be flat and the top of your rose will have dimension. Start out by making a bunch of roses. I made a smaller size as well by cutting the spiral of felt in half before rolling. I liked the added interest that two sizes of roses created. When you are ready, heat up your glue gun and start attaching the flowers to your wreath. 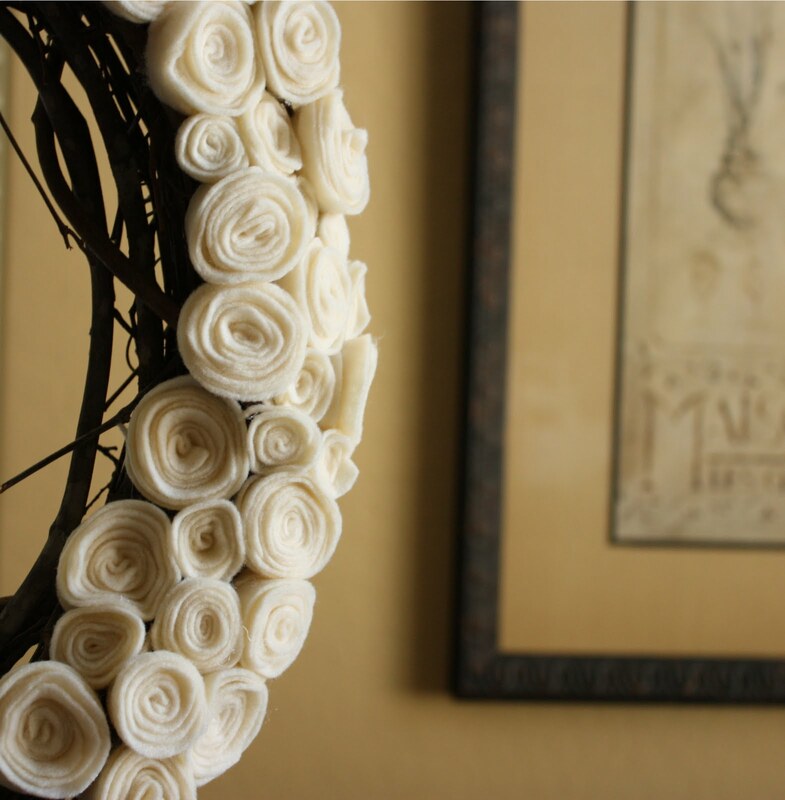 Before placing each rose on the wreath, be sure to put a dot of glue on the outer flap to hold it in place. Then, cover the bottom of the flower with glue and stick it on your wreath. I found it was easiest if I positioned three or four roses on the wreath first before gluing them. That way I was able to make sure everything fit the way I wanted it to. I also periodically held the wreath up and looked to make sure the roses were evenly circling the edges of the wreath. Because I live in Arizona and the sun would melt all my hot glue in about two seconds if I hung this on my front door, I opted to make this an indoor wreath and hang it over my bathroom door. I used an over the door wreath hanger, (as pictured in the first photo). Happy crafting everyone! Hope you enjoy this pretty and simple project. So. Gorgeous!!! Thanks for sharing this awesome tutorial with us! WOW! Heidi that looks FABULOUS! It's darling! It's so fun being the "inspiration." This wreath is gorgeous. Thank you for sharing!! thanks for tutorial... love these roses... gorgeous! this is so pretty! I've made these roses from scrapbook paper, and had so much fun! Can't wait to try it with felt. I love the way the felt roses tunred out. I'm going to have to give it a try. Thanks for sharing! So simple and pretty -- I love it! I really love the look of this! I will be making one myself! Thanks so much for the tutorial! Stunning!!!! I can think of alot of projects using these cute little roses!!! I want to do one with phonebook!! This is so pretty! Would make a great wreath for a baby's room, too. Gorgeous! beautiful! 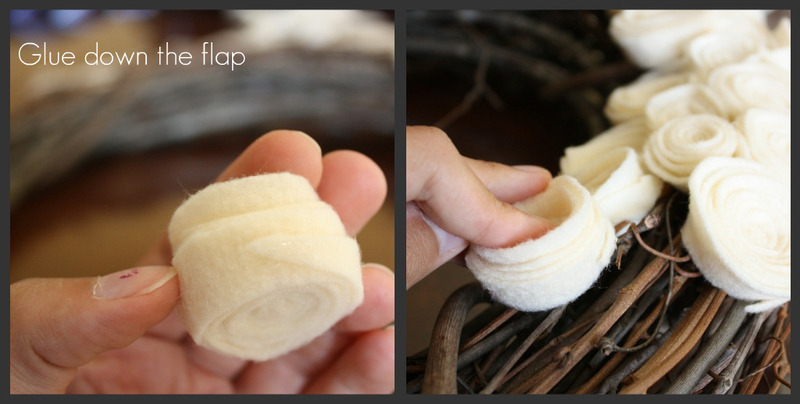 i've been making lots of felt rosettes lately & this is a wonderful use for them! Very creative! I loved it so much I featured it on my blog to share! Thanks for sharing! I just made some with a thrifted purple Ralph Lauren sweater-so pretty. I'm going to embellish a gift bag with them. So glad you all are enjoying this tutorial! Thank you for the comments and compliments! I love the look of this! Very classy and beautiful! I am going to feature you on my blog tomorrow. :) Thanks! Thank you so much for this. I've been trying to make wreaths using fabric rosettes but maybe I will try felt. So fun! lovely, so easy and so pretty! thanks for sharing! que belo trabalho!!!! lindo demais,parabéns!!!! I found your blog from a post on green submarine. I love this wreath. 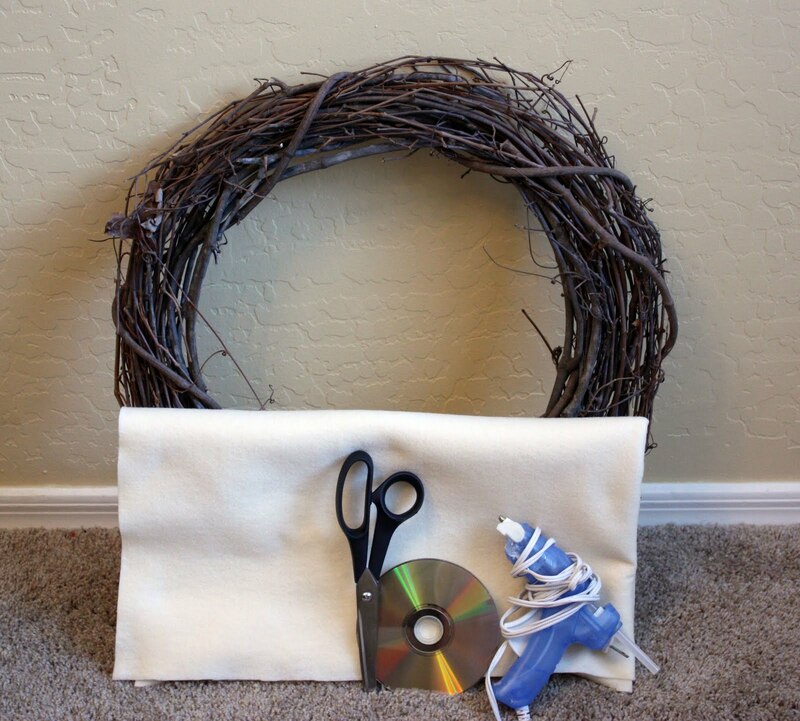 I just bought a new grapevine wreath a few days ago and am looking for inspiration. So, thanks for inspiring me. I just made one and posted about it here: http://deliacreates.blogspot.com/2010/09/fall-wreath.html. This is great! I can't wait to do this in this year's Christmas colors! So warm looking. And I have never thought about the sun melting your hot glue in Arizona. You just made me say, "Huh" out loud. This is so great!!! Bravo! My sister and I have bought the supplies and will make it today. I might go back to the store and buy red felt and see what that will look like. I LOVED your wreath and featured it here. So cute! This is just stunning. Thanks for the inspiration! I am trying the rosettes and it's going well, thanks to you! I need to make one of these immediately. It is so so so so so so cute!!!!!! I love love love this!. Hope you don't mind stealing this. I have been looking for something to make this winter that was different interesting and beautiful. THis is it! Thank you for sharing! I made two of these, a large cream one and a smaller red one. I LOVE how they turned out! Just lovely! Going to make a few as Christmas gifts. i found this by googling "felt roses" and my project turned out so pretty. thank you! I made a multi-colored version of this wreath, with a giant felt poinsettia, and it came out really great! Thanks for sharing this awesome tutorial! I recently featured it on my blog here: http://founditmadeit.blogspot.com/2011/01/fabric-roses-tutorial-roundup.html Thanks for keeping me motivated! Hi. I loved this tutorial. awe, this is beautiful! I hope to make an attempt at making this really soon. Thanks for the tutorial. love it. Hi, I know this post is a little late, but I was wondering where you buy a wreath like this? Very pretty! Can u tell how many roses did you put up there!? Love it! I just made one with burgundy and off-white roses, with a few walnut-colored ones tucked in here and there. For the previous poster, I was curious myself, so I actually did a quick count of half the wreath in her picture. It worked out to approximately 100 for the entire wreath. Hope this helps! first saw this on pinterest and the pic lead me to you. i appreciate you sharing your idea with all. i am looking forward to making one of my own. great idea here. thank you. Gorgeous. Thanks so much for sharing this amazing idea. Just pinned it.